How many different citruses can you think of? As I told before, in my childhood there were just four different citrus fruit – orange, mandarin, lemon and later grapefruit. Since it was pre-Internet, I didn’t even know about other varieties. Of course, by now I’ve widened my fruit horizons, so as a mental exercise, without looking it up online, I came up with additional seven: pomelo, clementine, tangerine, lime and Meyer lemon – from my grocery shopping trips; and from my perfume hobby, I know about bitter orange and bergamot though I’ve never seen or eaten them. So, eleven in total. While everybody in our household loves citrus fruits, citrus fragrances is probably one of the least represented categories in my perfume wardrobe. It’s not that I do not like how many of them smell, but somehow I always think about cologne-type creations as of “lesser” perfumes than their oriental, woody or even floral relatives. For a while I’ve been contemplating buying one of Atelier Cologne’s citrus perfumes but kept postponing until I finish the travel spray of Orange Sanguine and a decant of Cedrat Enivrant. And then Atelier Cologne came up with the fifth cologne in their Joie de Vivre series – and I surrendered. Brand’s site gives the following notes for this perfume: clementine from California, mandarin from Italy, juniper berries from Macedonia, star anise from China, Sichuan pepper from China, basil from Egypt, vetiver from Haiti, sandalwood from New Caledonia and cypress from France. Clementine is not my favorite fruit; and I’m not sure that I would recognize its smell or even taste from, let’s say, tangerines. But Clémentine California smells great whatever citrus it’s supposed to invoke, and it is extremely juicy, bright and uplifting. It probably can be classified as unisex but, in my opinion, it’s a little sweeter than a “civilian” man would choose to wear. I cannot say that I like Clémentine California the most out of the 5 citruses in the line – I like Orange Sanguine and Pomélo Paradis probably not less. But Clémentine California bought me with the name; and I bought a bottle. 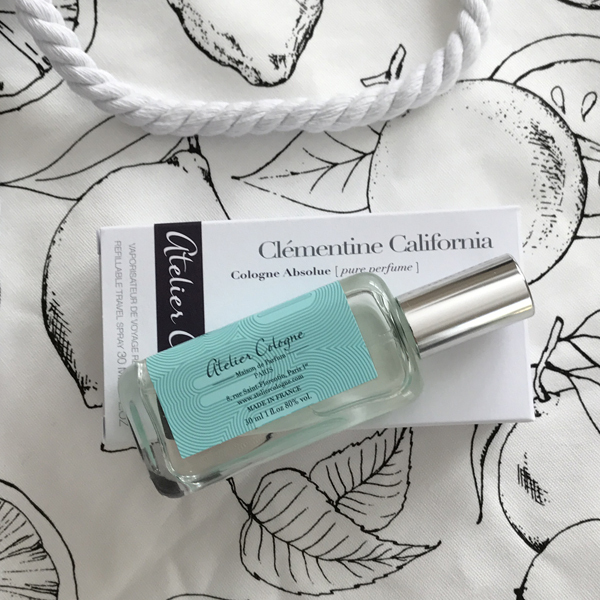 As the name pushed me towards this perfume, I kept thinking about it and even got annoyed: if it’s Clémentine than why not Californie; and if it’s California, why not Clementine? And, in general, why clementine and California – whatever language you choose? I do not have a definitive answer: if they’ve explained it in some interviews or in an ad copy, I haven’t found that. But I have a plausible theory based on what I read in Wikipedia. The fruit was first discovered in 1902 by Brother Clément Rodier, so it was named after him – first in French and then in English. The first commercial production of the fruit started in California in 1914. So that English-French centaur makes some linguistic sense. By the way, do you know that there are only four original citrus species, from which the rest of cultivated citrus hybridized? No, those four aren’t the same four that I knew growing up. According to Wikipedia, the four core ancestral citrus taxa are citron, pomelo, mandarin and papeda. This entry was posted in "Four legs good", Favorite Perfumes and tagged Atelier Cologne, Clementine California. Bookmark the permalink. Rusty seems to be a fan of citrus too. Now I’m debating my opinion on their new Cafe Tuberosa. Plus I love your citrus-themed tote bag / beach bag. Rusty loves oranges and also eats grapefruits and sometimes mandarins. Atelier Cologne’s bottles, especially small ones, are very nice with or without a leather case but I like those as well. It’s a good color but I didn’t get it with my bottle. But I got that tote on the picture. I haven’t tried CT yet but the only way I’ll like it is if it’s how you complained – mostly coffee and not much tuberose. Rusty has a good fruit taste. When my family had a wiener dog she wasn’t fond of grapefruit, but she would eat sweeter fruit. I agree, those 30 ml bottles are really lovely. Leather case is just a nice accessory to it. Oh really? so it’s atelier bag! It was some type of promotion when I ordered my bottle. I’m not sure yet how to use it but I’ll find some use for it. Looking forward to your review and trying Cafe Tuberosa. BTW, nice new avatar: I haven’t noticed it while commenting from my phone. I’m trying to give my citruses some fair skin time but working in the A/C’d office where I have to wear long sleeves (ok, 3/4 sleeves) to stay comfortable even during the summer, I’m not too tempted to wear them. How about weekends? Do they get some skin time then? Some :). You see, on weekends I’m trying to test something new during the day; and in the evening I want to wear one of my NSFW perfumes, since I have a lot of those in my collection. Papeda is a new one on me. I only found out about yuzu and pomelo through perfume! I really like the Parfum de Empire Yuzu Fou but for some reason, don’t like paying the big bucks for citrus perfumes. Funny you wrote about an uplifting perfume on the same day as that’s the topic for our Mood Scent 4 post. Hopefully Atelier Cologne still do the travel sizes. Clementine California sounds lovely. AC are doing all possible sizes, so it shouldn’t be a problem to find a small travel spray of any of the main lines’ perfumes. Yuzu is also great in jam-like product for making hot or cold drinks. I do not make a drink – I just eat it with my tea. Good for you for clearing up the ‘English-French centaur’ mystery – love that phrase. I do like clementine the fruit a lot, and tend to buy clementine juice rather than regular OJ when I have occasion to buy juice at all. I love Orange Sanguine and am now curious about your latest acquisition. I must say Rusty tones in splendidly with the fruit. One of my theories was that he likes fruits of the same color scheme as he is. In addition to earlier mentioned oranges, mandarins and grapefruits, Rusty eats mango and apricots. If you like Orange Sanguine, you’ll like this one as well. Whether it’s eating or spraying, I love citruses, Undina. I must look out for this Atelier Cologne. PS: In the pic, Rusty’s eyes match the bottle’s label. Cute! How common is this brand where you live? Do any of the stores carry this line? Atelier Cologne is available in South Africa and I have tried quite a few. But I have not spotted the one you mention. Enjoyed reading about your Atelier experience. I adore their citrus. Pomelo Paradis and Grand Neroli are my favorites at the moment. I spritz them whenever I see a tester but have not purchased a bottle. It’s so hard to choose one. A few decants and samples from the line keep me happy for now. If Atelier were to offer 15 ml bottles I would have a hard time saying no. Years ago my family included a brother-sister pair of cats, she loved to eat apples, he loved to eat oranges. Thank you for sharing Rusty with us. He is so handsome. Not trying to be an enabler, but Sephora has 10 ml bottles for some of the perfumes including Clementine California. They also have a set of 3 x 7.5 ml of three colognes – clementine, pomelo and orange. If nothing else, Rusty gets treats for his participation in my photo shoots. What a great photo of Rusty with the bottle! I really enjoy Clementine California. I have a 30 ml bottle that I received in gratis when I was still working at Sephora. Oddly, the non-clementine notes are my favorites. The basil and sichuan pepper add a really interesting twist. And I did not know that there were only four original citrus species. I’m learning so much here! I agree that it’s one of good pictures of Rusty: he was just about to bite on that rope. I’ve been meaning to tell you that you crossed my mind several times a few weeks ago. My mother spent a few weeks in the ICU at California Pacific Medical Center on Buchanan St. in San Francisco before passing away. I spent some time wandering around on Fillmore St. after visiting her to clear my head and found Le Labo and Atelier, which of course made my think of you and your blog. The sales associate at Atelier was kind enough to give me a couple of samples, including Pomelo. I haven’t tried said samples to decide if I like any of them well enough to take the plunge to buy a full size sample. I will keep you posted on what I decide. So sorry for your loss, Juli. I hope you find comfort in perfumes you cherish. I’m so sorry for your loss, dear Juli. I’ll send you an e-mail tomorrow. I know about Le Labo boutique but I’ve never been to it – only at Barney’s (they carry the line). As to Atelier Cologne, luckily, Sephora carries many of their perfumes; and there are many mini-sets and small bottles. I can also pass onto you at least several of samples. But when you get a chance, you should try Jasmine Angelique and Rose Anonyme: I don’t have these samples but you might like them. I’ve ended up with a few samples of Atelier – Pomelo, Fig, Jasmine, Clementine and Rose. So far I like the Clementine and Pomelo best and high on my list to purchase next. The Jasmine works for me as well, but feel it is similar to something I already have so it’s on my list for consideration but not an immediate must have. The Rose is ok – I have a hard time with fragrances where rose is the main note. I thought we were going to get another how figs get to be figs story (and I still cringe whenever I think of that post while eating fresh figs – oh shudder)! Rusty looks so guilty in that last picture – what a cutie! I like pretty much everything Atelier. I should wear my collection more often. Rusty didn’t want to pose for this picture but then got interested by that tote’s rope handle and decided to play with it – though he wasn’t sure how I would react. 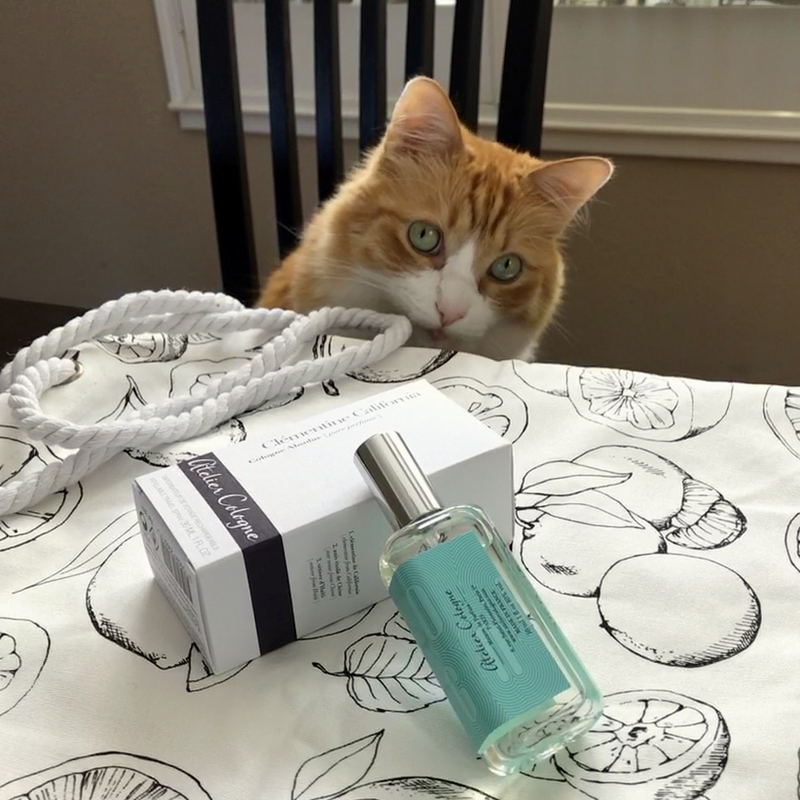 Rusty is so beautiful…..and I am happy to see you have acquired another bottle…I like Atelier as they are very versatile fragrances. You already know I am a big fan of the Atelier line….like hajusuuri stated above I too like just about everything….good choice on your new full bottle :) I hope you enjoy it! This is the first Atelier Cologne’s bottle that I bought for myself AND to share with my vSO. All other bottles are either his or his that I use from time to time.